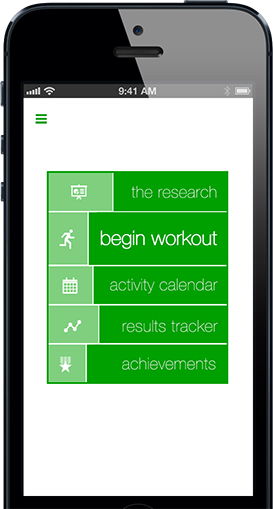 fitness app for the iPhone and iPod Touch. transform your body for a mere 7 minutes a day. challenge! Download the app today! What is the "7 Minute Workout Challenge"? Backed by peer-reviewed scientific research, the “7 minute workout” is becoming an international hit. The authors, Brett Kilka (C.S.C.S., B.S.) and Chris Jordan (M.S., C.S.C.S.) have written a comprehensive research article. The researchers have put together 12 exercises that can be performed in seven minutes but achieve the equivalent of an hour’s workout. The catch is - you need to do them to the best of your abilities (high-intensity) and rest very little in between. When rest intervals are too long, it undermines the effectiveness of the workout. The 7 Minute Workout effectively increases your metabolism, so the benefit is in effect throughout the day. The 7 Minute Workout Challenge app for the iPhone, iPod Touch and iPad devices not only instructs you along the workout, but it tracks your results and encourages you along. That is why over a million people have taken on our challenge! Health Xperts Production. Toronto, Canada. All rights reserved.